A red card to Captain Scott Burton and four second half goals condemned the Blues to yet another away defeat this afternoon in the National League North. Following the man advantage, Joe Piggott, Josh Hancock twice and John Johnston did the damage at Moss Lane. The Blues were unchanged from Tuesday’s win over Blyth Spartans, but did welcome back Ben McKenna, Akwasi Asante and Simon Grand to the squad following injuries. It was a first half which yielded little in terms of chances – but the Blues worked hard despite lacking a cutting edge. One of the half chances came after ten minutes, Dan Mooney trying his luck from 25 yards bobbling towards the bottom corner but pushed away by Tony Thompson. Altrincham’s only real chance of the half fell to John Johnson. The tricky winger burst past Brad Jackson, but his low ball in from the left evaded any contact and dropped wide of the far post. Chester threatened to create big chances, Gary Roberts’ clipped cross just out of George Waring’s radius, and then Tom Hannigan put in a superb sliding challenge to deny Mooney a one-on-one opportunity. Already booked following a shirt pull, Captain Burton was given his marching orders for a second yellow after a lunge in the middle of the park. 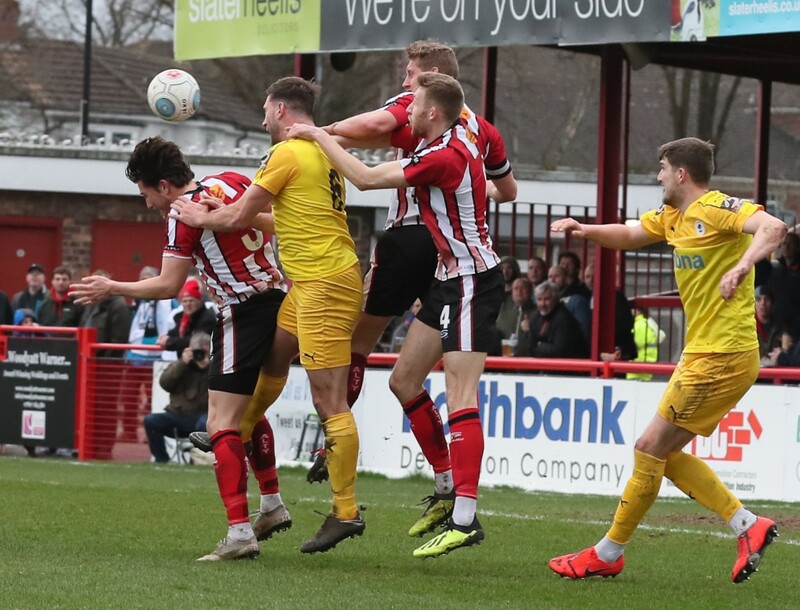 A minute later, Altrincham made the man advantage count as loanee Joe Piggott turned home after good work from Hancock. Hancock, Alty’s top scorer in the league, then helped himself to a brace in the space of six minutes. First, he lashed one into the back of the net from just inside the box. Then on 69 minutes he was alert in front of goal to turn home after Shenton had parried from Jake Moult. Anthony Dudley fired over in a half which gave the Blues nothing to shout about, before the icing was put on the cake in the final minute. Sub Simon Richman shot low towards goal, and Johnston sealed an excellent afternoon for the hosts – diverting the ball into the net. CHESTER FC: Shenton, Jackson, Howson, Livesey, Waters, Mahon (McAllister 72), Roberts, Burton, Mooney (McKenna 65), Dudley, Waring (Marsh-Hughes 83). SUBS NOT USED: Grand, Asante. SCORERS: Piggott 51, Hancock 63 & 69, Johnston 90.